(1995) Tonight the Stars Revolt! Singles from Tonight the Stars Revolt! Tonight the Stars Revolt! is the second major label studio album by American rock band Powerman 5000. It was released on July 20, 1999 by DreamWorks Records. Having sold over one million copies and achieving platinum status, this would become the group's most successful release and featured such hits as "Nobody's Real" and "When Worlds Collide." Although it doesn't tell a specific story, the songs have a cohesive theme, primarily oriented around campy science fiction reminiscent of the 1950s, coupled with nihilistic, apocalyptic messages, and paranoid, cyberpunk imagery. Music critics and fans alike compare PM5K frontman Spider's fixation on bygone science fiction with older brother Rob Zombie's obsession with B-movie horror themes. Both seem to share an affection for campy entertainment that influence their musical output, though Spider has since abandoned science fiction as the inspiration for Powerman 5000's sound and image. The CD booklet of Tonight the Stars Revolt! is also composed with science fiction imagery and text, similar to Zombie's horror-themed Hellbilly Deluxe, released the year prior. Musically, the album bears similarity to Rob Zombie's industrial metal sound with catchy riffs and electronic elements. However, it also includes a cover of The Cars' "Good Times Roll" and "Watch the Sky for Me," a moody, lounge song with its entire melody taken from the track "One More Kiss, Dear" by Vangelis for the Blade Runner soundtrack. CMJ (7/19/99, p. 3) – "...tighter than a barbed wire noose wrapped around your neck...[TONIGHT] relies on sci-fi imagery and memorable hooks that are sharp enough to catch more than a few big, heavy fish". The album won the Boston Music Awards for "Album Of The Year" in 2000, while "When Worlds Collide" was nominated for "Single Of The Year". "When Worlds Collide" featured in Tony Hawk's Pro Skater 2 and Twisted Metal. It also served as the theme song to WWE SmackDown! vs. RAW and featured on the Little Nicky soundtrack, Free Air, Vol. 2, and MTV The Return of the Rock. "Nobody's Real" featured on the End of Days soundtrack, Gravity Games 2000: Summer Sounds, Vol. 1, and Naked 4-Play as a live rendition. "The Son of X-51" (Remix) featured exclusively on the Bride of Chucky soundtrack. "Supernova Goes Pop" featured on the Universal Soldier: The Return soundtrack and Gran Turismo 3. "Tonight the Stars Revolt!" featured on the Blade II soundtrack. All lyrics by Spider One. All music by Powerman 5000. The song "Watch the Sky for Me" ends at minute 3:50. After 30 seconds of silence (3:50 - 4:20), begins the hidden track "The World of the Dead". 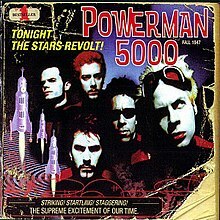 ^ "Powerman 5000 - Tonight The Stars Revolt! CD Album MP3". Cduniverse.com. July 20, 1999. Retrieved March 12, 2012. This page was last edited on 24 February 2019, at 14:25 (UTC).